Home » Academics » Schools » College of Arts, Humanities and Social Sciences » Faculty » Rev. George T. Montague, S.M., S.Th.D. 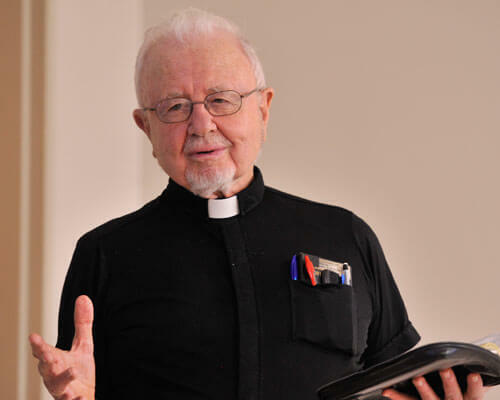 Author of over twenty books on both the scholarly and popular level, Father Montague has specialized in the Pneumatology of both Old and New Testaments, having written or contributed to a number of studies in that discipline. He has also researched and written in the field of Biblical Interpretation (Hermeneutics), and in the Marian theology in the Gospel of John. Having done his doctorate in Paul, he is especially interested in Paul’s theology of spiritual growth. He did a summer study in Israel with Hebrew Union College and participated in the excavation of Tel Gezer in 1966 under William Dever, Ph.D. The courses he teaches are about the New Testament deal with values that he believes are important to life and raise the question of faith as the source of a full human life. Prior to teaching at St. Mary’s University, he was a professed Marianist and also taught at a high school for six years. When he’s not teaching, Father Montague enjoys playing the guitar and birding. Throughout his career, he has presented lectures in six different continents. THE VISION OF THE BELOVED DISCIPLE: MEETING JESUS IN THE GOSPEL OF JOHN (Staten Island: Alba House, 2000; available now only from Fr. Montague). UNDERSTANDING THE BIBLE: A SHORT INTRODUCTION TO BIBLICAL INTERPRETATION (Mahwah NJ: Paulist Press, 1997) Revised and Expanded Edition, 2007. CHRISTIAN INITIATION AND BAPTISM IN THE HOLY SPIRIT: EVIDENCE FROM THE FIRST EIGHT CENTURIES (with Kilian McDonnell, OSB). Second, revised edition (Collegeville: Michael Glazier, 1994). Translations in Italian, French, Spanish, Portuguese, Polish, German, Hungarian. THE APOCALYPSE; UNDERSTANDING THE BOOK OF REVELATION AND THE END OF THE WORLD (Ann Arbor: Servant, 1992) OP. THE APOCALYPSE AND THE NEW MILLENNIUM (Ann Arbor: Servant, 1998) Revised edition of 1992 book, with added material on the new millennium. Now available as reprint only from Fr. Montague–address below. FANNING THE FLAME: WHAT DOES BAPTISM IN THE HOLY SPIRIT HAVE TO DO WITH CHRISTIAN INITIATION? Heart of the Church Consultation, editor with Kilian McDonnell, OSB (Collegeville: Michael Glazier, 1991). Collaborative effort of 10 theologians and pastoral leaders. Translations published in Polish, Dutch, French, Spanish, Italian, Czech, Korean, Urdu, Portuguese, Japanese, Lithuanian, Maltese, Swedish, Slovak, German, Russian, Chinese and Indonesian. MARK: GOOD NEWS FOR HARD TIMES (Ann Arbor: Servant, 1980; reprinted by Franciscan University Press, Steubenville, OH, 1992, then by St. Mary’s University, San Antonio, Texas. Available now only from Fr. Montague–address below). President, Catholic Biblical Association of America, 1977-1978. Editor, The Catholic Biblical Quarterly, 1972-1975; associate editor, 1969-1971, 1976-1979.